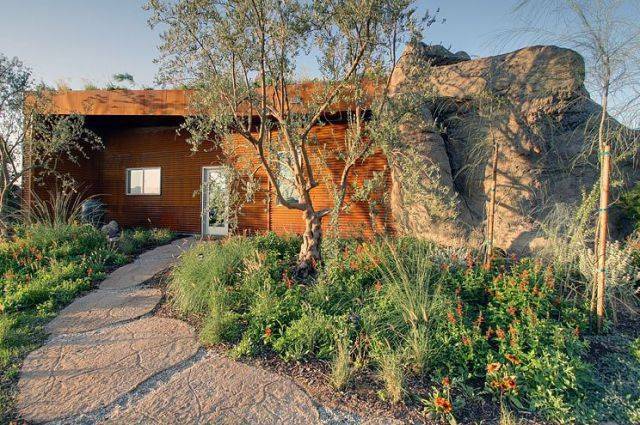 The Joshua Tree Boulder House proves imagination is still alive and well. Every inch of this 1700 square foot, 2-bed / 2-bath home is intentional, and every design element is deliberate. 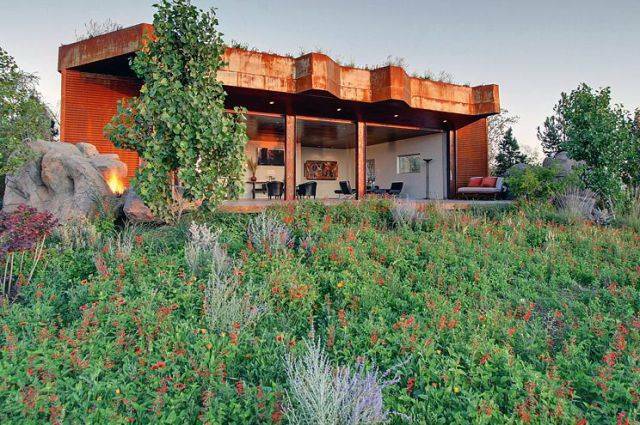 This magical creation sits on 2.5 acres in Joshua Tree, California. The house is the brainchild of W. Garett Carlson, ASLA, a licensed landscape architect for more than 30 years. His landscape designs grace Hollywood’s recently remodelled Sunset Marquis Hotel, as well as the gardens of celebrities such as Jack Nicholson, Goldie Hawn, Johnny Depp, Blake Edwards, and more. The house was built with sustainability in mind, using an intriguing palette of metal, wood, concrete and glass to create a peaceful modern living space where traditional boundaries are dismissed. Ten-foot high, custom-made floor-to-ceiling pocket glass doors open to create a 40 feet wide expanse that connects the living area to the landscape. 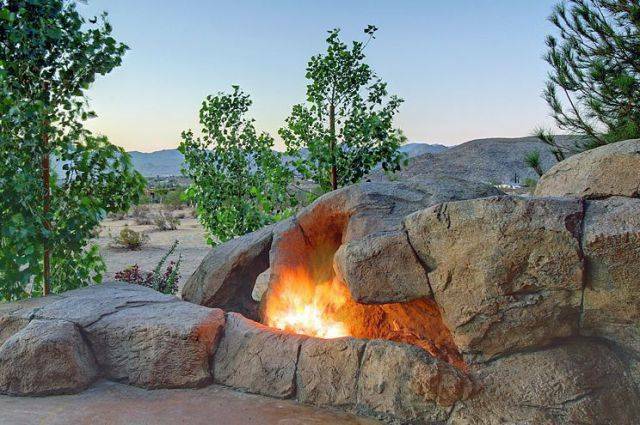 A fire pit to one side of the patio, and a water feature on the other side are both set within boulders to further enhance the experience. This is indoor/outdoor living at its best. 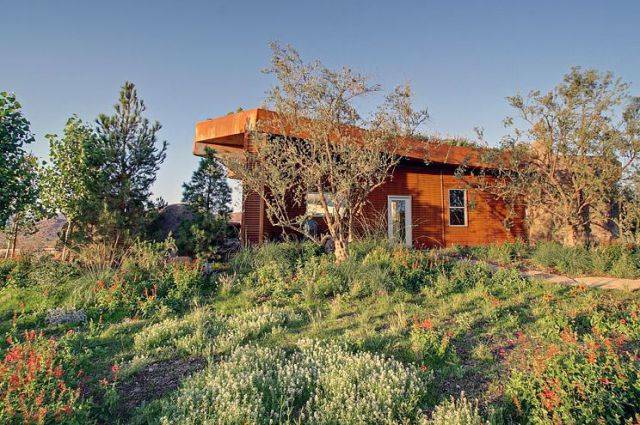 The roof of the house provides insulation in a novel way: up to 18” of soil covers the sloping roof, planted with a wide variety of native California wild flowers and grasses. Seen from above, the roof appears to be a part of its desert landscape. Structural steel I-beams support the 250,000 lb load, designed to withstand a 10-point earthquake. The roof has a 3’ pitch: 11’ on the east side, which also creates the space for the wall to wall 10’ sliding glass doors – down to 8’ on the west side. The pitch also allows the roof garden to drain. Corrugated steel siding on the house and the garage is the highest gauge and quality available. Inside,the floor’s surface was ground smooth , then sprayed with dyes to create a natural-looking surface. The floor was then polished and waxed to create a rich patina. The ceiling is tongue and groove Douglas fir, with several layers of dark stain and varnish to create a deep shine that subtly reflects the finish of the floor. The kitchen features custom built dark wood and glass cabinets and state-of-the-art appliances. Bathrooms have custom cabinetry, Caesarstone counters. The master bathroom features a deep soaker tub surrounded by blue glass tile. Custom closet – off the master bedroom, a walk-in closet features custom shelving and drawers to maximize the space.